I arrived at Zak Pelaccio's Carmine Street pop-up restaurant Fatty Johnson's last Thursday night and sidled up to the bar. Frank Cisneros, who incredibly balances the job of Dram Bar's head barkeeper, Bols Genever brand ambassador, and running his own new bar Drink in Brooklyn, was guest bartending so I was excited to see what was on tap. It was nightcap time which typically means a flip during the winter months. So, I found the perfect alternative on Frank's one night only custom menu, an old classic that is making a comeback - The Golden Cadillac! The Golden Cadillac was created at Poor Red's BBQ in the old Gold Rush prospector town El Dorado near Sacramento, California. According to Poor Red's website, they are the largest consumer of Galliano in the world and crank out thousands of the cocktail each year. - 30 herbs and spice, including anise, juniper, vanilla, and lavender with an aroma of anise. 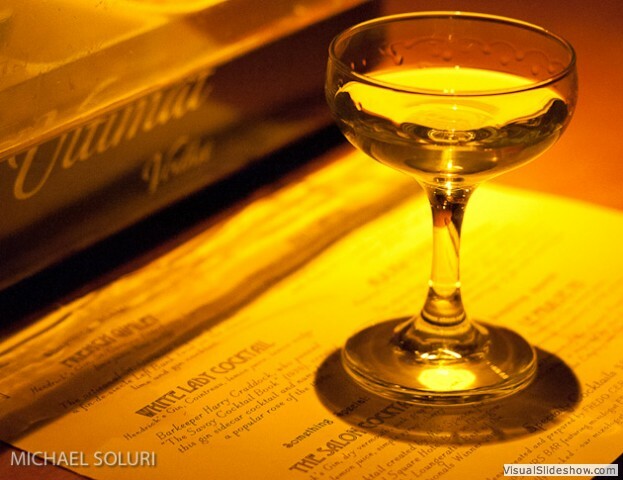 I regard Galliano as the Italian cousin of the monastically produced herbal liqueur Yellow Chartreuse. However, Galliano is less sweet and it's current formula emphasizes anise flavor over vanilla. This balances well with the chocolate flavored crème de cacao and the result is a cocktail that is rich, potent, but not overly sweet. Combine Galliano, crème de cacao, and heavy cream over ice. Shake rigorously for 10-15 seconds and double strain into chilled cocktail glass. Dust with cinnamon and garnish with thin strip of orange zest. Where to get it: Painkiller Tiki Bar in NYC features the Golden Cadillac on their spring cocktail menu, Dram Bar in Williamsburg, and Poor Red's BBQ in El Dorado, California of course. 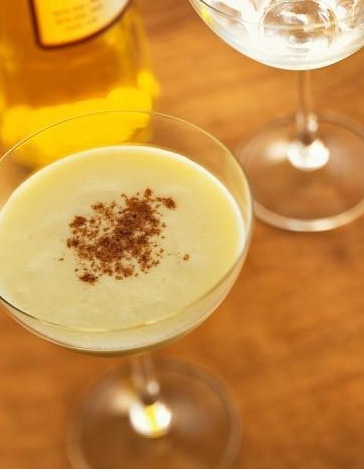 The Golden Cadillac is a great night cap or dessert cocktail. Bartenders love to make it and the drink has a cult following which will only increase as Galliano's resurgence continues. The event runs from 7pm to 1 am on Friday March 11th. Doors open at 7pm for a three course dinner seating on the main floor and at 8pm for general admission which includes Top Shelf Open bar. Loungerati's Fredo will be creating a cocktail menu that is part classic and part Sinatra hey day period cocktails. Top-shelf open bar all night and hors d'oeuvres - doors at 8pm. Tips, taxes and coat check included. I highly suggest buying advance tickets because the prices go up after Feb 10th. For this extravaganza, we're pulling out all the stops... we've put together a band featuring four legendary musicians who played with Frank Sinatra, and we've invited some of the best singers on today's scene to perform their favorite tunes from the Sinatra Songbook. Plus we have a full lineup of live music, burlesque, DJs and mixologists at the beautifully restored 1930's Edison Ballroom, which boasts one of the best dance floors in NYC! CELEBRATING SINATRA - with Bucky Pizzarelli, Derek Smith, Jerry Bruno & Jimmie Young. Featured Singers - Hilary Gardner, Ron Sunshine, Queen Esther, Todd Londagin, J. Walter Hawkes, Dandy Wellington, and more! Swingin' 18 piece big band on the best dance floor in NYC. Two full sets following the Sinatra band! Performing on the mainstage during the VIP dinner hour, and later in the lounge. Coat Check, Tips, Taxes & All Gratuities included! VIP table with prime view of stage, Four Course Dinner, top-shelf open bar all night - seating at 7pm - special VIP performances by Grace Gotham and Gelber & Manning. Tips, taxes and coat check included. Dinner menu available on website. For The Salon's 10th Anniversary extravaganza, we're pulling out all the stops... we've put together a band featuring four musicians who played with Ol' Blue Eyes himself, along with some of the best singers on today's scene, performing their favorite tunes from the Sinatra Songbook. We also have a few of our favorite bands from the last decade, and some of NY's top Burlesque dancers and Mixologists. Don't forget the open bar all night long and free hors d'oeuvres. Everything is included, and we mean everything - tips, taxes and coat check. All of this and more at the beautifully restored 1930's Edison Ballroom, which boasts one of the best dance floors in NYC. Some might suggest this night will be historic; What can we say... we just like a swank party.